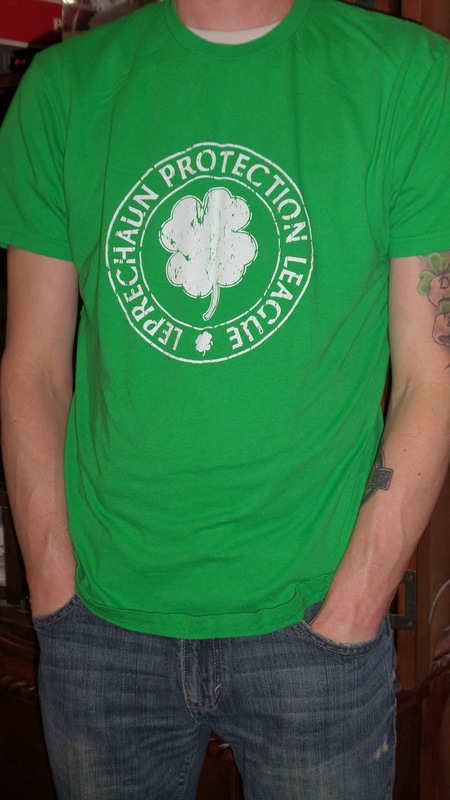 You know its funny I never really paid any attention to how much I would advertise my Irish Heritage growing up. I was just always very proud of it as were my sisters and we always tried to take every opportunity we could to support it however possible. We have grown up always wearing our green colors, wearing different types of claddaughs, and of course later in life drinking like your typical Irish! Once I started college I quickly realized that there seems to be one day a year that everyone chooses to be Irish - St. Patty's Day! Because it has always been second nature to all of us we never went out of our way to find T-shirts around the holiday because we already owned a ton of them personally. Now though it is an extra bit of fun each year to add to my collection especially when I find that really awesome site! 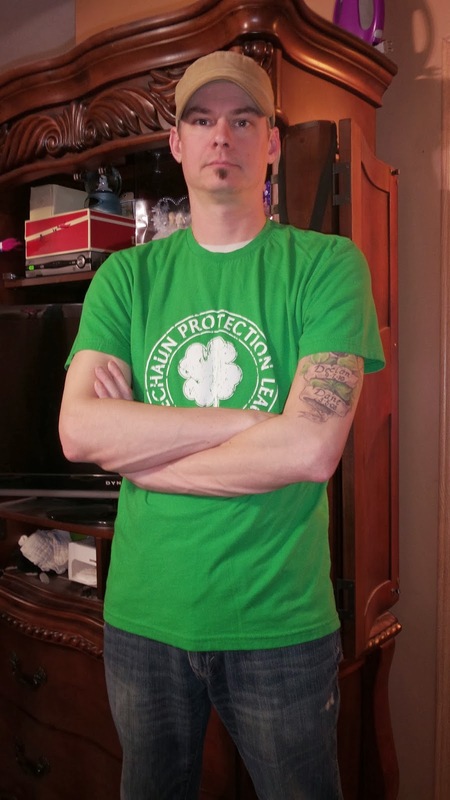 So when the opportunity came up this year with Tomoson, I just knew I had to be picked to review one of Saint Patrick's Day Shirts. 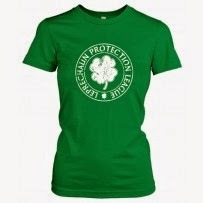 There are tons of designs to choose from - anywhere from silly sayings and graphic tees to novelty shirts and Irish pride. They carry shirts in all sizes baby, children, adult men and women. 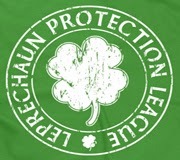 Kevin and I were super excited to get the Leprechaun Protection League T-shirt from them! Oh I forgot to mention that Kevin's birthday just happens to fall on St. Patrick's Day which is yet another bonus for our household. He has been wearing his shirt around a ton and absolutely loves it. The material of the shirt was well made and printed and does not appear to be fading or falling apart after several washes! It is also printed correctly on the shirt which seems to be a fault you find in different T-shirt companies. If they aren't concerned about quality, you tend to find one's that aren't centered or with mistakes on them. Recommendation: Now granted I may be a bit biased, I still think everything here is a decent pricing. There are so many things to look at you could be on the site for hours picking out gifts for others or something special for yourself! lol as the saying goes "Everyone's Irish on St. Patty's Day!" I'm a big chunk Irish but no one ever notices unless I dye my hair red. Then people swear that they could tell ALL along. ;D Love the tees!